A weekend jaunt unlike any other. Legend has it that Madrid’s biggest draw is its air and water quality. Well, according to its locals anyway. The water is clean enough to drink from the tap, and the dry air is continuously fueled by a pleasant breeze that provides a reprieve from the infamous heat of the country. The distinctive combination has lured in monarchs who, throughout time and amid their travels, found solace in the captivating and architecturally rich characteristics of the capital. Hemingway was himself a target of the beguiling pairing, seeking refuge in a city that became a major source of inspiration in his works. The author’s favorite haunts are scattered throughout the city, each encompassing subtle odes to his love affair with Madrid. Walk into any old-fashioned bar and chances are you’ll come across claims of Hemingway’s residency, which is not entirely far-fetched given his storied reputation. La Venencia is heralded as being Hemingway’s preferred watering hole and still bears many of its historic qualities such as a no-photo rule instilled in the early days as a precaution against fascist spies. Order a bottle of sherry and green olives and take in the remarkably well-preserved and unaltered decor. Madrid is shaped by its culturally rich history, thriving food scene, and bold artistic direction. Naturally, its design identity has flourished throughout the years, evolving with the city’s growing mix of influences. While it may undoubtedly be easy to fill out a robust itinerary, we curated a handful of our favorite spots for the ultimate (and quick!) getaway, with the design enthusiast in mind. Granted you’re up early enough, take advantage of the stillness of the city–as well as the precious few hours before the heat sets in–and wander around, taking in the views. In the heart of Madrid, off of Calle de Preciados lies Puerta del Sol (roughly translated to “Sun Gate”)—it’s the point of intersection of all the roads in Spain as well as the center of the country. As one would expect, the public square is nothing short of captivating: bustling, grand, and framed by the mix of Plateresque and Moorish revival-style architecture the capital city is known for. Prado National Museum and Museo Nacional Thyssen-Bornemisza are two of Madrid’s most iconic museums. The Thyssen began as a private collection in the 1920s and has since evolved to encompass a broader scope of works. The Prado is Spain’s national museum and is acclaimed for housing one of the world’s finest collection of European art. Calle de Goya and Calle Serrano are two of the more popular shopping destinations in Madrid—there, you will find a mix of high and low fashion. Replenish with sweets and a coffee from the famed Chocolatería San Ginés, one of the oldest spots in the city and then head to Mercado de San Antón for a truly eye-opening experience. The indoor market boasts a beautifully curated array of Spain’s most iconic eats, from fresh jamón to marinated olives and everything in between. Barrio de las Letras is where you will find Madrid’s famed art and theater district. Naturally, the area is dotted with an eclectic array of bars and restaurants. 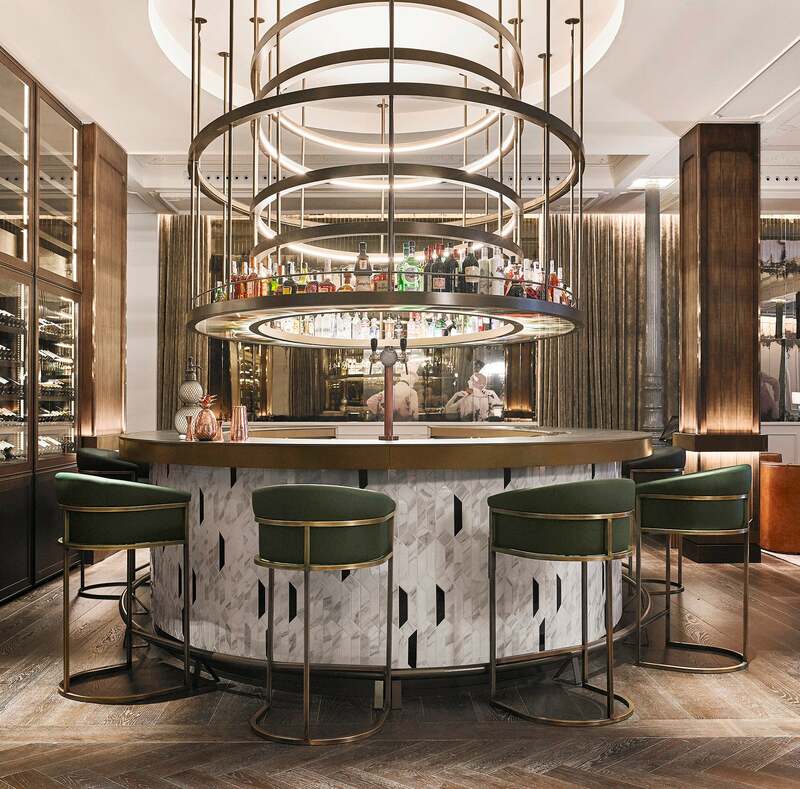 Grab drinks at the Gran Hotel Inglés, the oldest luxury hotel in Madrid, which recently underwent a stunning renovation and redesign led by Rockwell Group. A member of the Leading Hotels of the World (LHW), the establishment reopened in mid-2018 to great acclaim. Grab a drink at the lobby bar, LobBYTo, and take in the Art Deco–inspired design of the space that still bears many of the hotel’s original details. Vermouth is a celebrated spirit of choice with the red variety being the more popular choice. Have yours with a slice of orange and pair it with a side of croquettes and marinated olives. Take a quick siesta and let yourself get in on the local ways. Head over to Gran Meliá Fénix (a LHW property) for an indulgent round of cocktails at the dry martini bar. The local bartenders will impress you with their inspired skills, and the establishment’s extensive cocktail list (it ranges in the hundreds) will have you itching to try as many concoctions as you can stomach. Spain’s late-night dining culture is world-renowned and one that is aptly observed by residents and tourists alike. Relish in the rich culinary scene that Madrid has to offer: San Mamés, Bodega de la Ardosa, Habanera, and DiverXo are local favorites. End with a nightcap.